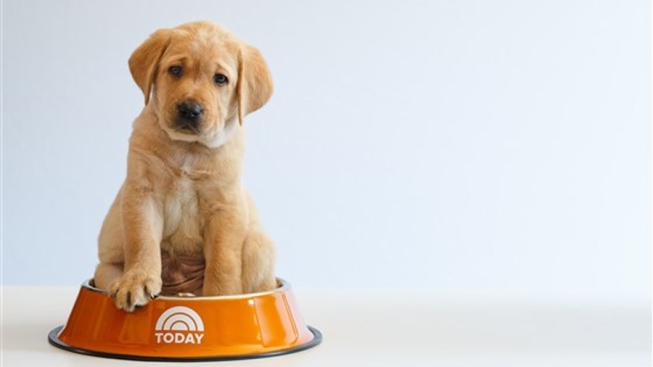 The "Today" show's as-yet-unnamed third Puppy With a Purpose. The new "Today" show puppy made his debut Monday, but this one's got his siblings with him, the show reports. The yellow Lab, who doesn't have a name yet, will be with the show for 16 months under guide dog mobility instructor Olivia Poff's tutelage as he trains with the Guide Dog Foundation. Eventually, he'll go to a visually impaired teen. And unlike Charlie and Wrangler, this puppy has a set of siblings. They will be headed to the NBC stations in Los Angeles, Boston, Baltimore and Atlanta, where they'll train to become support dogs as well. The "Today" anchors have made their picks for what the pup should be named and you can cast your vote for Lucky, Sunny, Mic or Goldie at the link below.